Two weeks ago AutoCAD 2014 was released. As always I downloaded it and installed it immediately with much anticipation. I downloaded the install software (about 3.65 GB) and it installed flawlessly in about 30 minutes to about 1.86 GB on my hard disk drive. There are a few install options: a network License manager, Autodesk CAD manager tools, and Autodesk content service, and Autodesk Recap. The first thing you’ll notice is the new splash screen graphics, which appear to be a very cool looking organic high tech medical device, but I really have no idea what it is. The software installed flawlessly on the 10 new laptops I was prepping for a class. However AutoCAD choked on the migration from 2013 on my home PC, requiring a reinstall. So what exactly is new and improved in AutoCAD 2014? First of all I should mention that the 2013 drawing file will be compatible with 2014. So a 2014 file will open with AutoCAD 2013 if needed. It seems like many of the changes to AutoCAD 2014 are fixes and improvements that the average user might not notice. So here it is my incomplete list of new features. New Autodesk Recap (ships with AutoCAD) is Photogrammetry software allows a user to automatically convert multiple photographs into a 3d model mesh and use the photographs as texture maps. Available on 360 accounts. Stay tuned for a blog on just this software! Updated: Security features to combat the growing list of AutoCAD targeted malware. New: Geo-Location allowing the drawing to be linked to maps like Google earth. However this is only available to 360 accounts. Design Feed, is a way to communicate with people about your drawings by tagging the drawing and posting comments. It allows real time chatting, this feature was adding from ACAD-WS. It also allows including images from your mobile device, but to use this you must be logged in to 360 and have the drawing shared on the cloud. Command prompt update: Customizable Auto Correct. Spell a command wrong and it offers alternatives. These command line improvements will slow down the response time, so if you tend to type your commands you may find this annoying and want to turn this feature off. I was typing PU and hitting for the purge command, and it keep going into the pan command, because it couldn’t keep up. Command prompt update: Synonym Lookup. So If you type a command it doesn’t recognize it provides some alternatives. Like “round” will return “Fillet”, or “Transmit” would return “Etransmit”. Command prompt update: Find user layer names and block names. While typing the name of layer, a the command prompt will try to set that layer current. A New File Tab which resides under the ribbon menu allows easy opening, closing and switching of drawings. Making this more like Internet Explorer 9, Firefox or Chrome browsers. 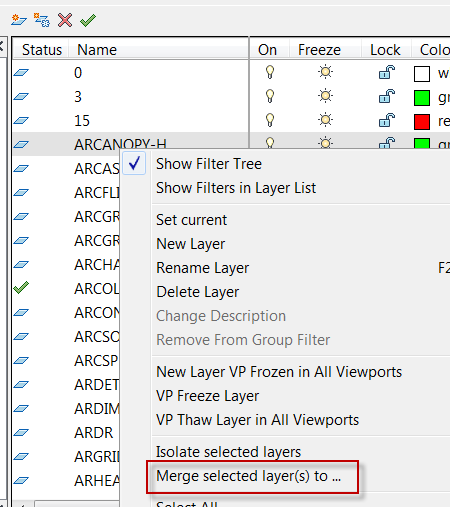 A new “Merge selected layer(s) to…” Option now appears as a right click in the layer properties dialog box. Allowing merging of layers to combine into other layers. Some Xref enhancements such as being able to right click on the attach button and change pathing options. Windows 8 is now supported so touch screen ribbon menu has been added. Update: The Arc Command now allows you to force the arc in the CW direction. 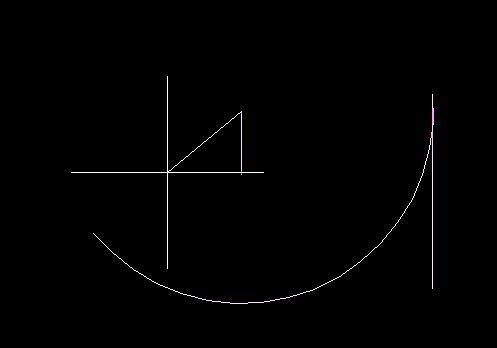 So a Start, Center, End Arc can be drawn clockwise by holding down the CTRL key. I’m told that enhancements to the screen graphics, viewport improvements have been made but I haven’t really noticed much change. Perhaps if I was doing graphic intensive 3d or rendering in AutoCAD I’d notice. 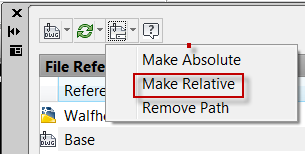 Hatch methods are remembered so if you use the select object method to define your boundary, it will use the previous method next time you hatch. Single line text justification is now “sticky”. Your previous justification is remembered and becomes the default next time you use single line text. Now admittedly this is not a complete list of new options, but I have covered the biggies. The Recap software that now ships with AutoCAD is the one thing that I found to be very cool. The technology is the amalgamation of a few technologies, and software ought and developed by Autodesk. A few years ago Autodesk acquired a company named Real Viz. RealViz had 2 products that were particularly good. The first was Stitcher which allowed multiple overlapping photographs to be merged into one large panoramic view with the perspective fixed, and the color corrected across all of the stitched photos. After a release or two under the AutoDesk label Stitcher disappeared and a similar software appeared named PhotoFly on Autodesk Labs. The second software was named RealViz imageModeler and also disappeared and re-appeared on AutoDesk labs as Catch 123. This “Photogrammetry” software allowed a user to take multiple photographs of a 3d object and it converted it into a mesh model and took the photographs and applied them as a texture map back onto the model. Now Recap allows this same kind of functionality plus the addition of point cloud captures from a variety of 3d scanning devices. Looking forward, AutoCAD 2015: If you’ve got a wish list, we want to hear it so we can pass it on. Contact us or go to the AUGI site to put your requests in.